Toast the almonds in a 350 F oven or on a dry, non-stick skillet, until fragrant and light brown. Do not let them burn. In a large bowl, combine almonds, oil, lemon juice and balsamic vinegar; season with salt and pepper. Add the spinach and half the cheese, toss well to coat them with the dressing. Add the remaining of the cheese on top, and serve immediately. 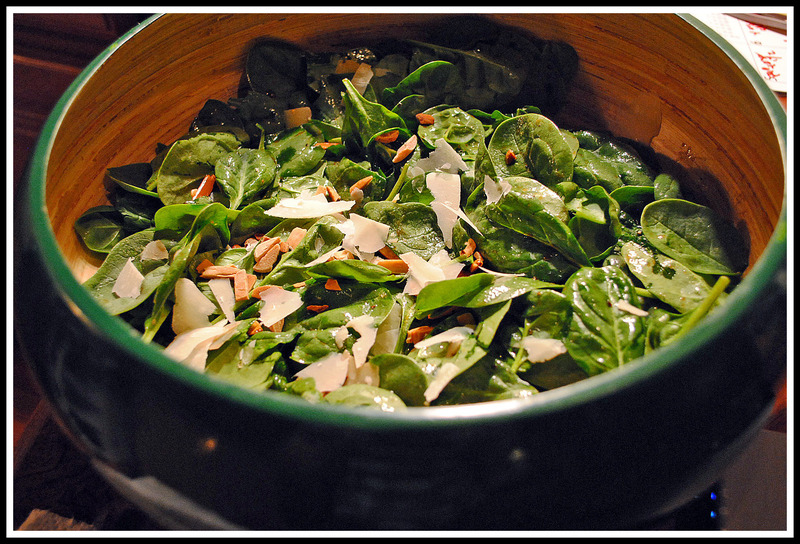 Comments: Spinach is the basis of this salad, but the almonds take the flavor to another level, from good to great. It’s all about how you toast them: if they’re just dark enough you’ll get an intense, popcorny flavor, without bitterness. This time I hit the jackpot, and I hope that you do too! We enjoyed it with salmon but it will complement many other dishes: roasted chicken, grilled pork, a juicy T-bone steak, or even a panini. The original recipe used arugula instead of spinach, so keep that in mind as an alternative. Torre as amendoas em um forno medio ou em uma frigeira tefal sem oleo, ate’ que dourem e fiquem bem perfumadas. Não deixe queimar. Em uma tigela grande, misture as amêndoas, óleo, suco de limão e vinagre balsâmico, tempere com sal e pimenta. Adicione o espinafre e metade do queijo, misture bem para incorporar com o molho. Adicione o restante do queijo por cima e sirva imediatamente. My compliments on your site. I subscribe to several sites such as yours and must say that none are more to my liking than yours. Your recipes are doable for me and appealing. The best part of your site is that you put some of the recips in Portuguese. Love that! Thank you so much. I have lived in Brazil for the past 35 years and enjoy reading the recipes in Portuguese also. I will pass them on to other friends and I know they will enjoy them also. You are doing a great job. Thanks again for all your hard work and the time you put into posting the thoughts and ideas. Linda, to wake up very early on a cold morning and find your comment was such a wonderful way to start the day! Thanks so much, it’s great to know you enjoy my blog and get something out of it. tasty classic….we do not have baby spinach here anymore (out of season, it is very difficult to buy it).